Acoustic punks, with sweet lyrics, sour vocals ranges, iconic songs, and a perfect balance of rage, and goofiness. There had never been a band like the Violent Femmes when they launched in the ‘80s, and there still hasn’t been. Lung at Johnny B’s on Wed., July 25. Doom cello, ya’ll. Doom cello. This Cleveland two-piece blasts moody, scrappy, raw and atmospheric rock with cello and drums. It’s both familiar and totally new, and sure to be thrilling live. Jacksonville doesn’t really get a lot in the way of metal shows. But the quality here ought to make up for the low quantity. Mastodon is as heavy and epic as its namesake, with blistering guitar and double-kick, beneath melodically complex songwriting and vocal harmonies. If you don’t like metal, Mastodon could turn you around. Or send you running for the hills. 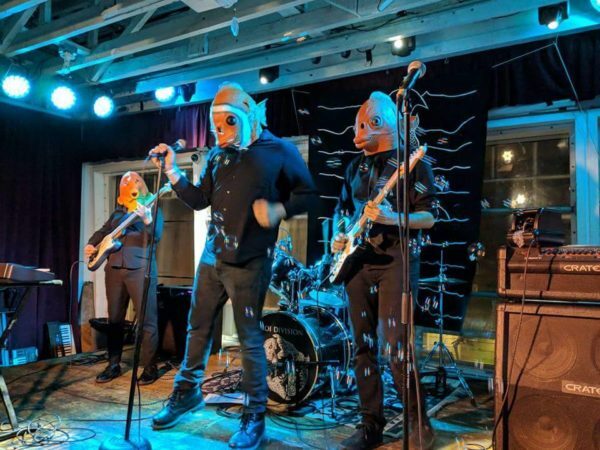 Koi Division, the only fish-goth Joy Division parody band that matters. And if you don’t want to see that, well then give it up now and go back the caves, cause there aint’ no point. We can’t say definitively that L.A. space-rockers Veers are going to be the next big thing, but they have just the kind of sound that easily could be: a spacy, modern take on Brit-rock that feels somewhere between Blur and Tame Impala.